Bonfire of the Vanities: Will President Bush drag down the GOP this year? There's a lot of discussion about President Bush's awful poll numbers, and all his many problems, and how this will affect the GOP in the fall elections. Let me be clear: I make no predictions. Political predictions are perilous, and a little suspect, for reasons I may get around to explaining by the end of this post. But let me say this, first, about this year's elections. I am skeptical of the notion that what people think about Bush will be a huge factor in how people vote in Congressional elections. Rather, I think the issue will be the way the actions of Congress itself. * Spending that is outrageously out of control. * Creating a new entitlement, the Medicare prescription goodie. * Enacting the so-called Campaign Finance 'Reform' (aka the Free Speech Restriction Act). * Failing to advance legislation of concern, such as the National Right to Work Act; while I don't pay close attention to other issues, I rather suspect gun-rights advocates might have a similar complaint. Let me know. If this is correct, then it may be that the House is more vulnerable; the Senate, at least, can point to the confirmation of two justices. Plus, while the House, in the wrong hands, can be a source of mischief, if the Senate stays GOP, anything bad can be stopped there. In short, GOP House members might have a harder time getting activists to care about their re-election, than Senators. That said, the GOP may still hold onto the House. But back to the "Will Bush pull them down?" question. Recall that in 1998, the GOP tried this approach with Clinton -- instead of forcing votes in Congress that put the Democrats actually on the ballot that fall, on the defensive, it pursued impeachment. The GOP attempted to make the President the issue. President Clinton's poll numbers were very low at that time. The strategy backfired; the GOP lost ground in 1998. Perhaps because a "don't you hate Clinton?" campaign had one, key flaw: Clinton wasn't on the ballot! Most people might be a little puzzled by the argument, "If you hate him, you should vote against her, because they belong to the same party!" It doesn't follow. So why should it work any better this year, for the "Hate Bush" crowd? Put it another way: the thing with elections is, someone has to win! No matter how stupidly a candidate behaves, he can still win, provided his opponent behaves similarly, or worse. So someone looking at the current situation and saying, "the GOP has so many vulnerabilities, they are bound to lose" omits consideration of a key fact -- it remains to be seen whether the Dems will supply their own stupidities, and give the GOP a relative advantage. Also, most of these assertions are making judgments about the "big picture," the national mood. But Congressional elections are a series of individual elections. National mood and national issues certainly play a part, but individual characteristics of the makeup of the district, of the candidates, etc., cannot be accounted for in such broad-brush approaches. Third, you should know that most of the people who offer these comments on TV, in print and on the Internet are not asked to give their opinion because they're so astute; but because they are merely plausible as sources of this information, and they are available for comment, and for various reasons, all to happy to spout an opinion. Very few of them are terribly concerned about making wrong preditions, because they'll have plenty of opportunities to give a different prediction; and even if they are flat-wrong, odds are they'll still be asked again--because they'll remain plausible and available. The sort of people who really have something intelligent to say about these things are usually not as glib -- e.g., they won't answer stupid-question-number-one: who will win this fall? -- and therefore they don't make good copy; so even if asked, they don't make it into print; and they don't get asked often. So, what you get is fewer of the really smart folks, and more of the really airheaded-but-love-to-be-quoted folks; as it is, the proportion of the latter is bound to be greater than the former. Having said all that, I will say this: people who I think are more insightful in these matters include Michael Barone, whom I link at your right; Robert Novak, whose column I check regularly; Tom Bethel, who is fairly astute in politics, and writes for the American Spectator and occasionally the National Review, but alas, doesn't write about politics all that often. Fred Barnes, who edits the Weekly Standard and appears on the Fox Network, is usually sensible, and not easily taken in by a particular trend, although a little too much of a cheerleader for the Bush White House for my taste. Congress usually exchanges hands about every 6 years, so I wouldn't be suprised if the Dems got over on the GOP. GOP can look bad until the Democrats have to show up and actually say something. 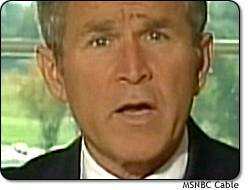 I think a lot of folks are tired of everything being aimed at bashing Bush. When they show up, folks actually want them to say what they would do. No one believes a Democrat will be for cutting spending except in defense of our country. As to the medicare prescription goodies, Democrats have been pushing for government run health care for ages. Campaign finance is a joke. Lets see if they close down 527's. With all respect, I believe Congress has no business "closing down 527s" -- that's yet more violence to free speech. That the GOP has made the noises it has, about yet more restriction on free speech, is yet another indication it has lost its way; and lost the confidence of many of its supporters. Father, if you want to allow unlimited funding of 527's, then they should open wide all funding of political speech with one essential item and that is all donations must come with full public disclosure. The 527's are a joke because you can have people outside our country provide unlimited funding (Soros)so they can influence elections and policy. Free speech is good unless you yell fire in a crowded theater and that is what these groups are attempting to do with their move to bring America under some global control. Just like the communist in the old days, they like to use great sounding names like America Coming Together and Center for Public Integrity. They place limits how how much I can give to a campaign for a candidate I back as an American, but do nothing to limit what Soros can through into the campaign of his choice.